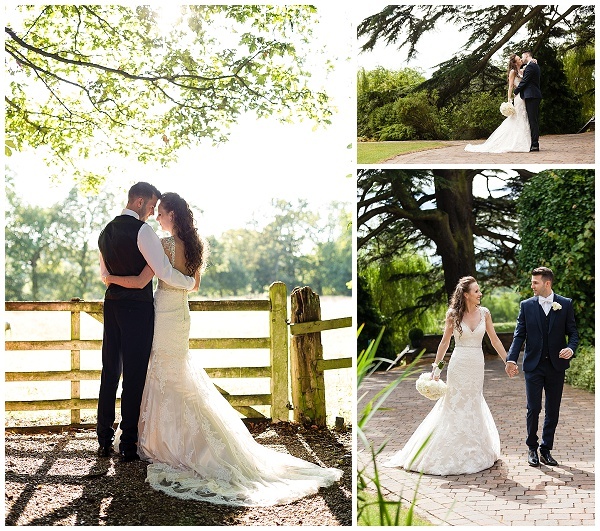 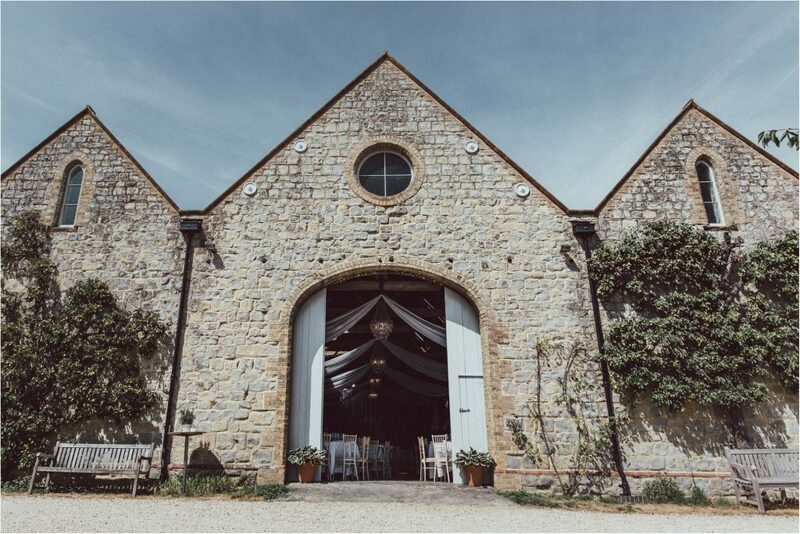 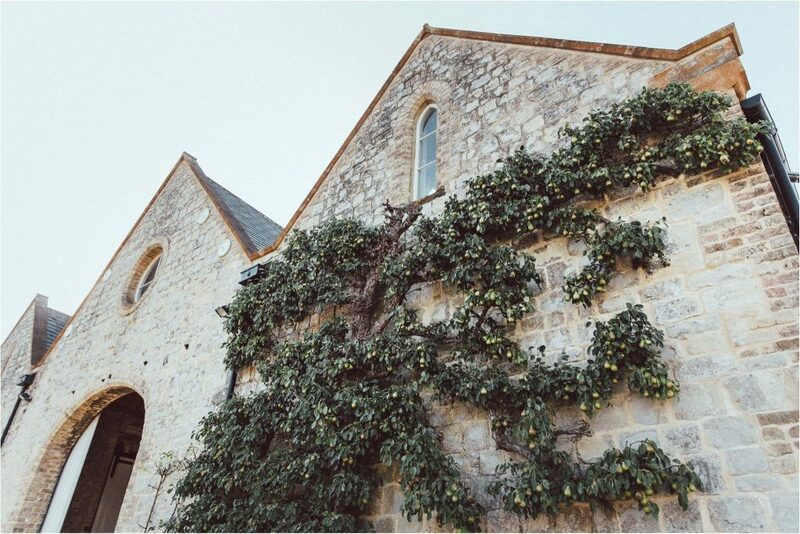 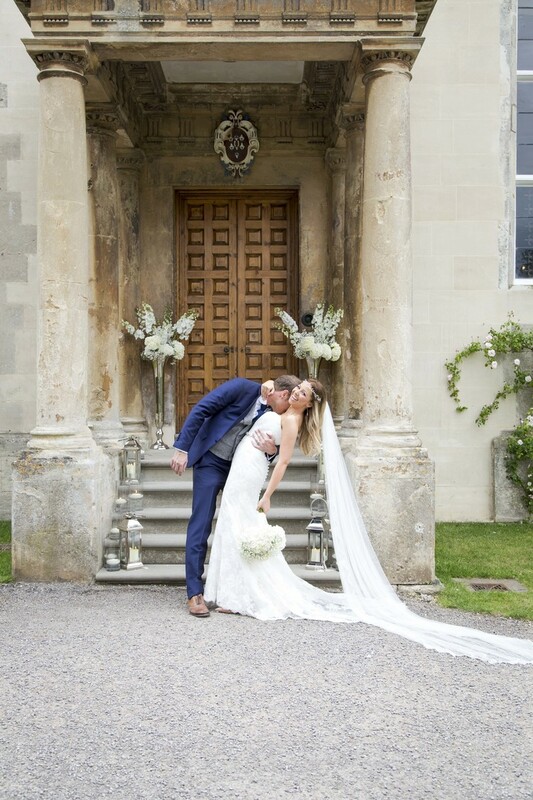 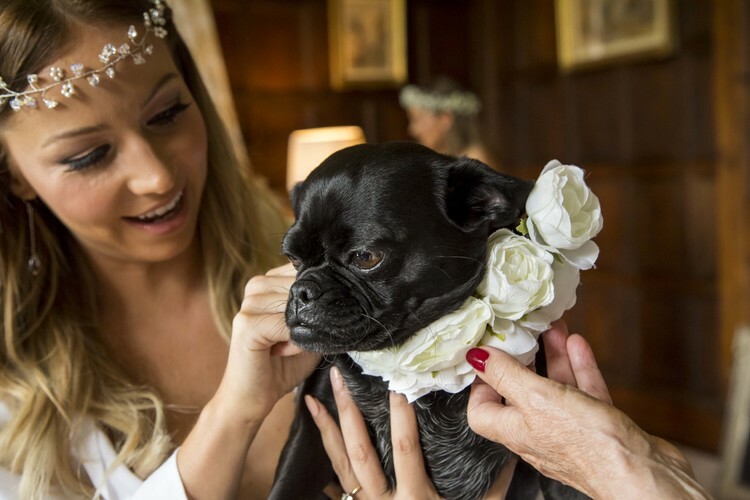 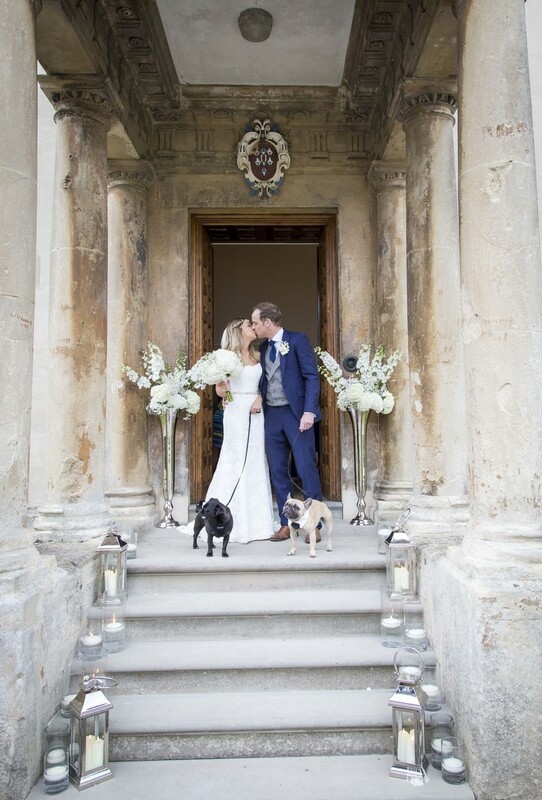 Chris and Lucy tied the knot at the beautiful Elmore Court, the most amazing place for a summer wedding. 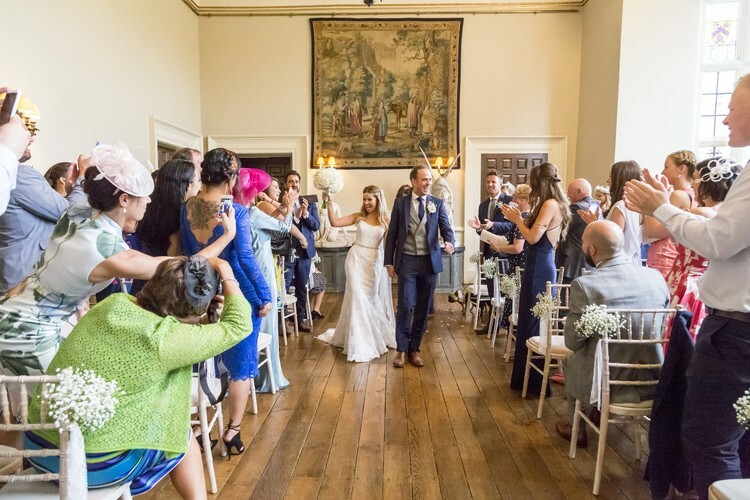 Elmore Court is run by festival folk and our couple embraced the whole festival vibe and continued partying late into the night and early morning with guests camping in the field around the house. 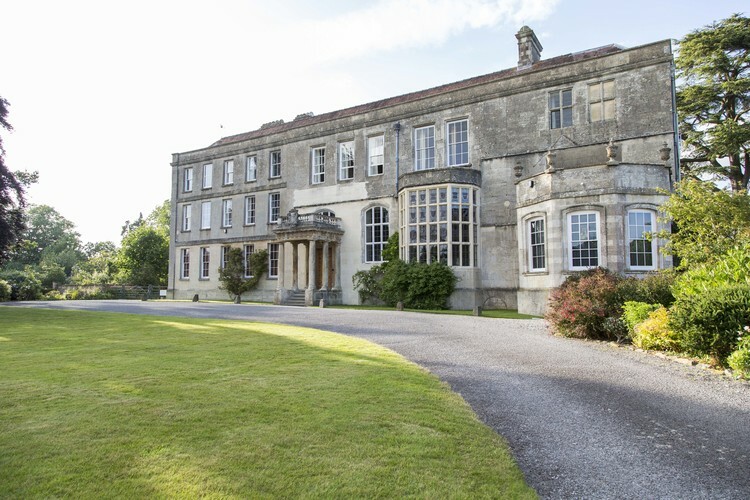 Elmore Court is a unique venue in Gloucestershire with the most historical house where the ceremony is held. 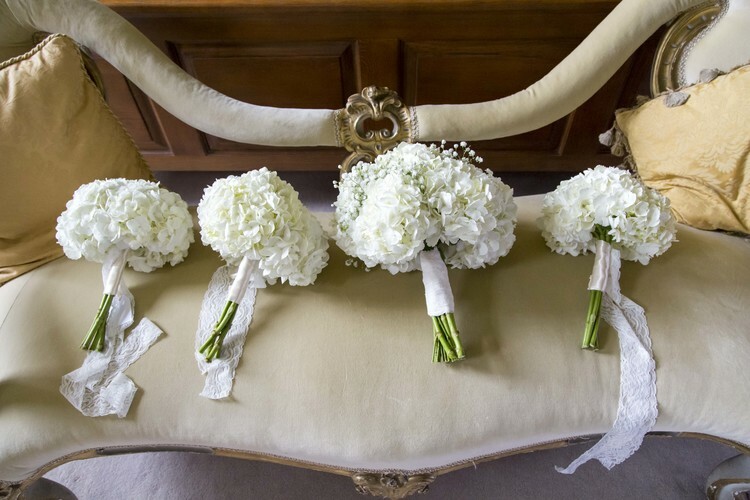 Lucy had a good idea of what she wanted for her bouquets and chose classic white hydrangea bouquets with flowing ribbons. 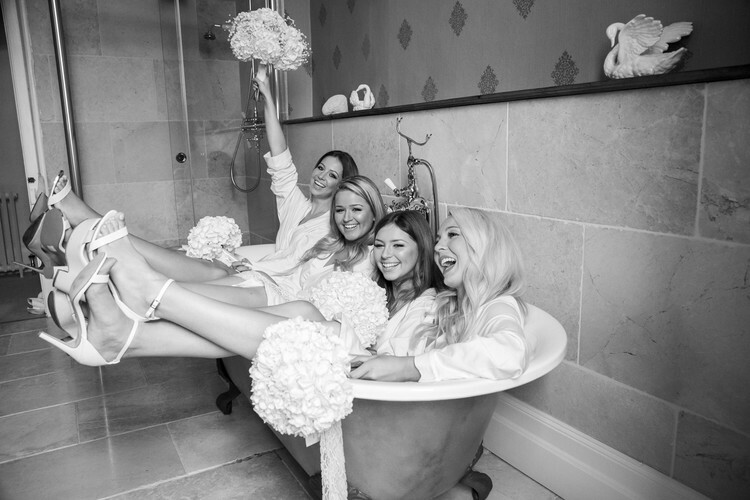 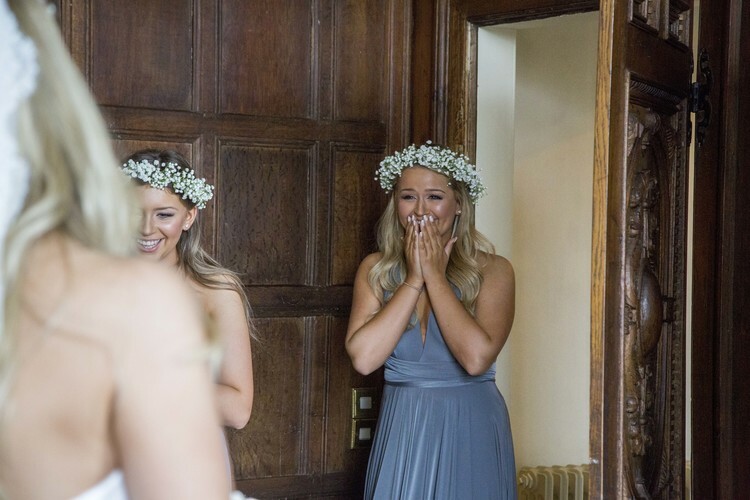 The bridesmaids wore fluffy bridal crowns of delicate Baby’s Breath to enhance their dreamy dresses and Lucy’s bridal bouquet. 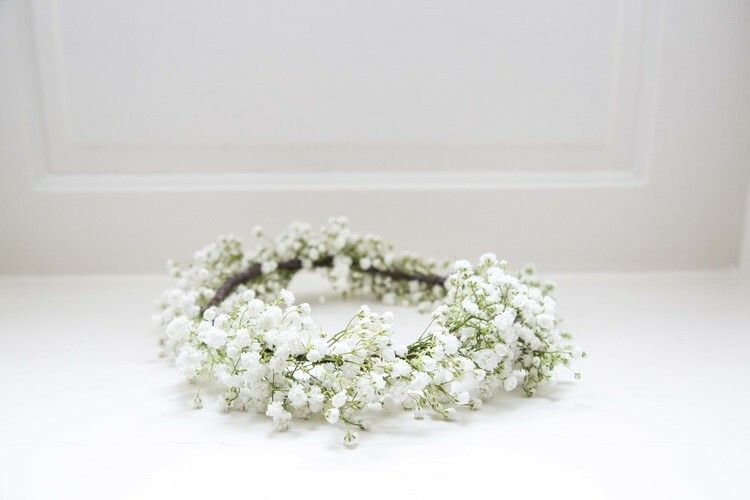 Baby’s breath was used in decorations throughout the wedding being a favourite of the brides. 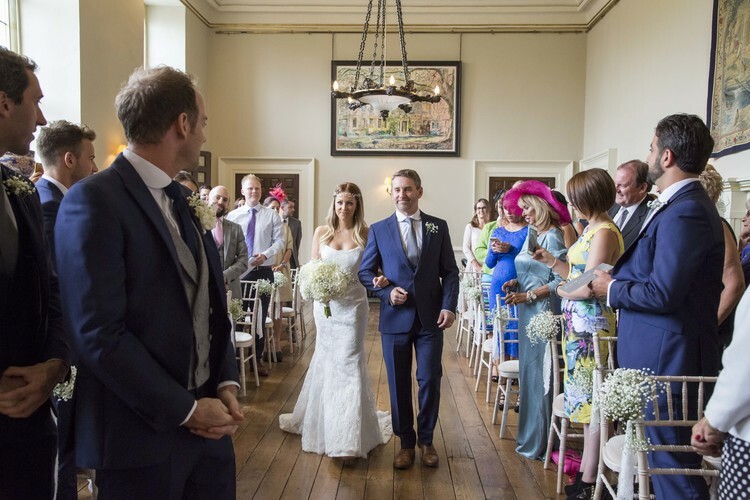 A lucky charm as Chris and Lucy are now blessed with the most beautiful baby boy. 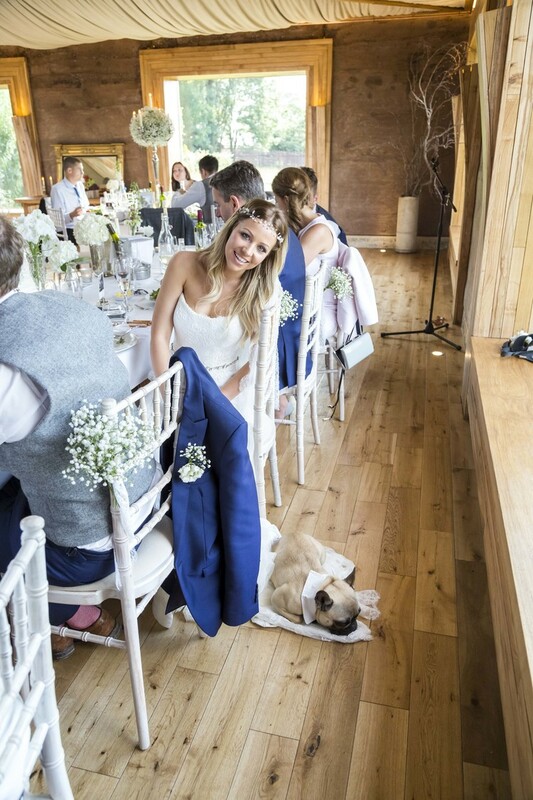 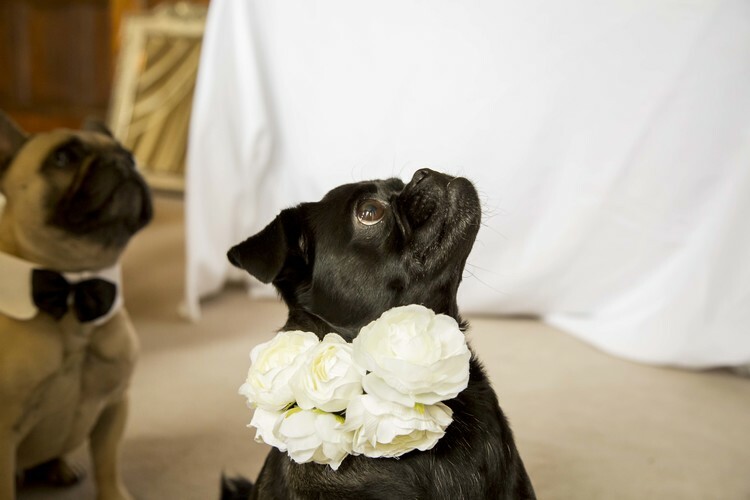 The dogs were guests of honour at the wedding and followed Lucy everywhere. 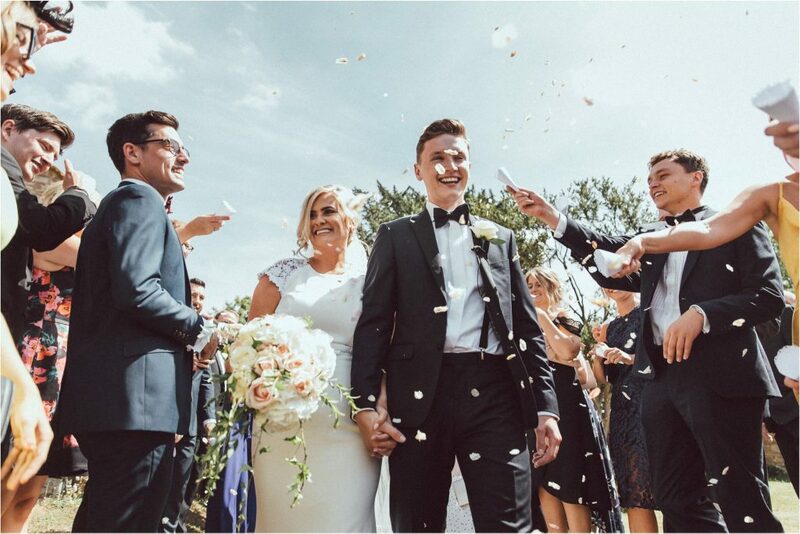 I just love their outfits, don’t they look so cute all dressed up for their special day. 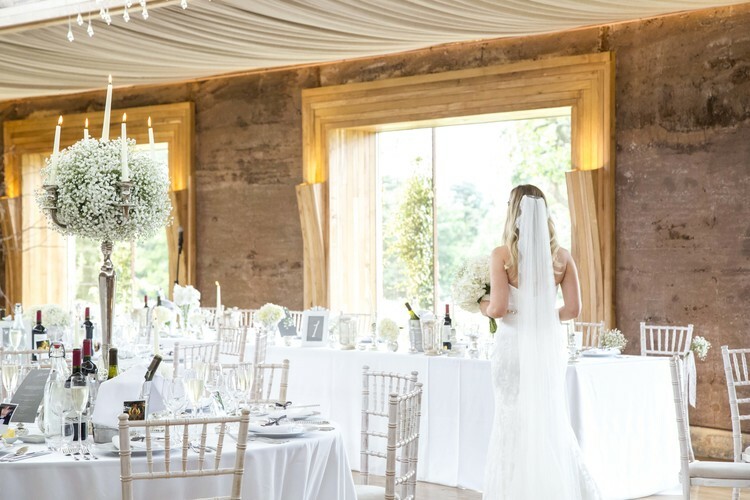 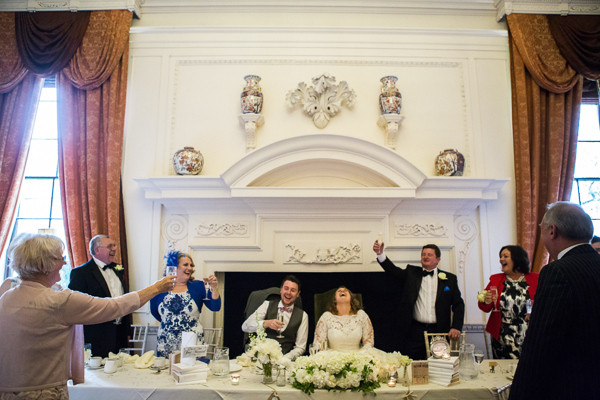 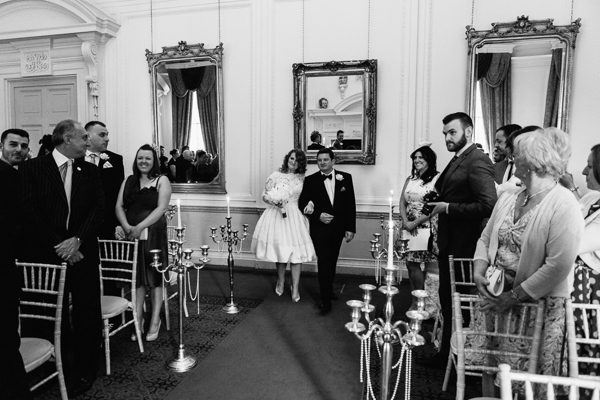 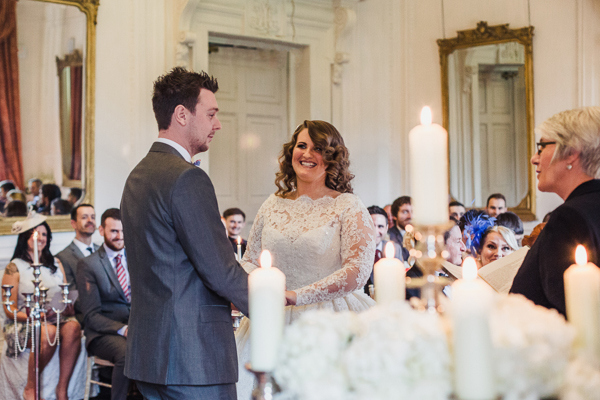 Lucy and Chris chose to hold their ceremony inside to take advantage of the elegant setting of the house. 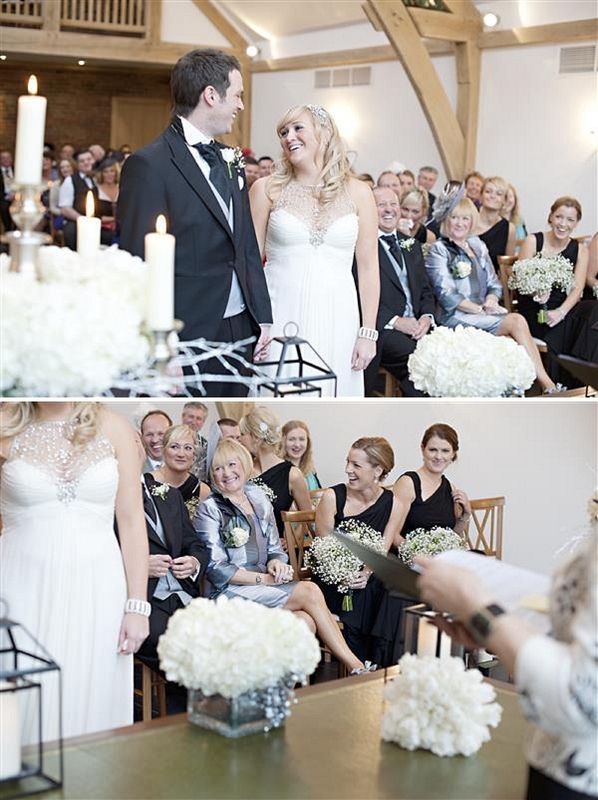 Friends and family joined in their celebrations in such an amazing space. 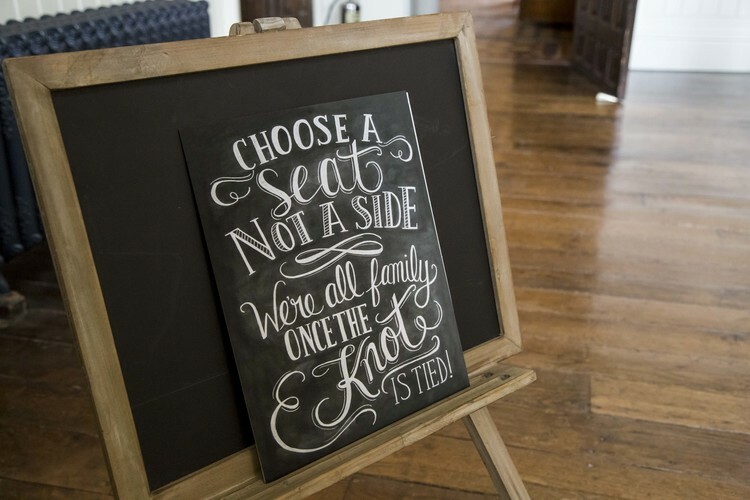 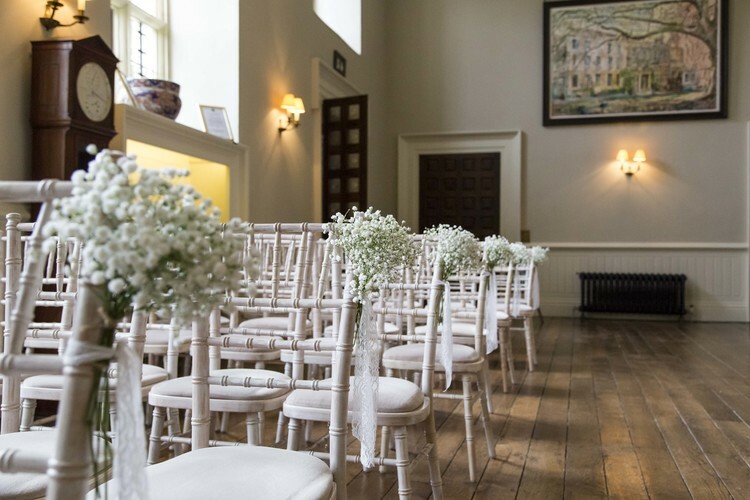 We added tied bunches of baby’s breath to the chairs for aisle decoration and they bought one of our ‘Choose a seat not a side, we’re all family once the knot is tied‘ signs from The Wedding of my Dreams. 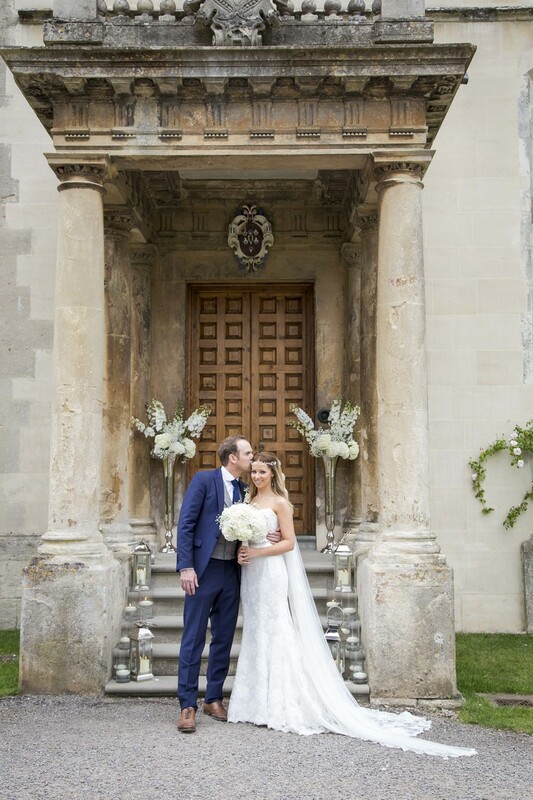 Grand entrances deserve grand decor and so we created florals in tall silver vases and arranged candles in silver lanterns and glass cylinder vases down the steps. 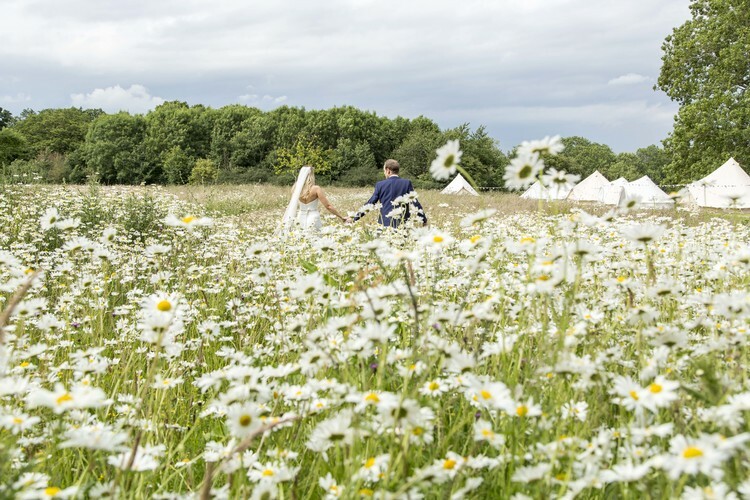 The gardens are just so beautiful and in June are full of flowers, I just love these shots in the relaxed meadow planting around the house. 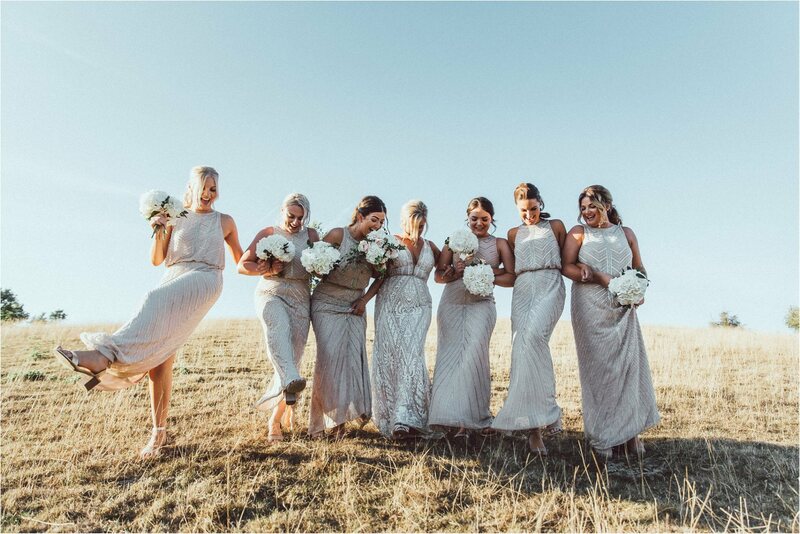 Can you just glimpse the tipees in the distance? The Gillyflower is a striking building set in the grounds of Elmore Court, its rammed earth walls and huge glass windows give the appearance of being in the meadow. 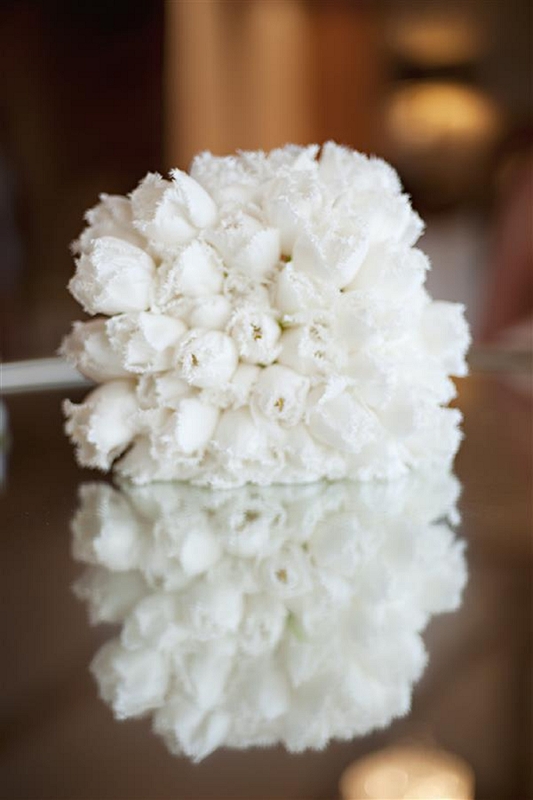 Wedding flowers and styling need to reflect this and so we chose all white flowers with delphinium, hydrangea and clouds of Baby’s Breath. 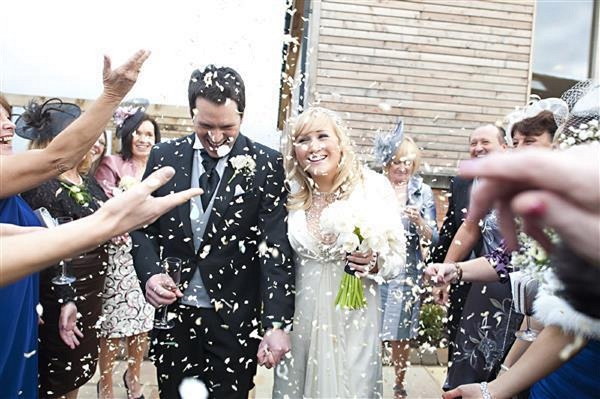 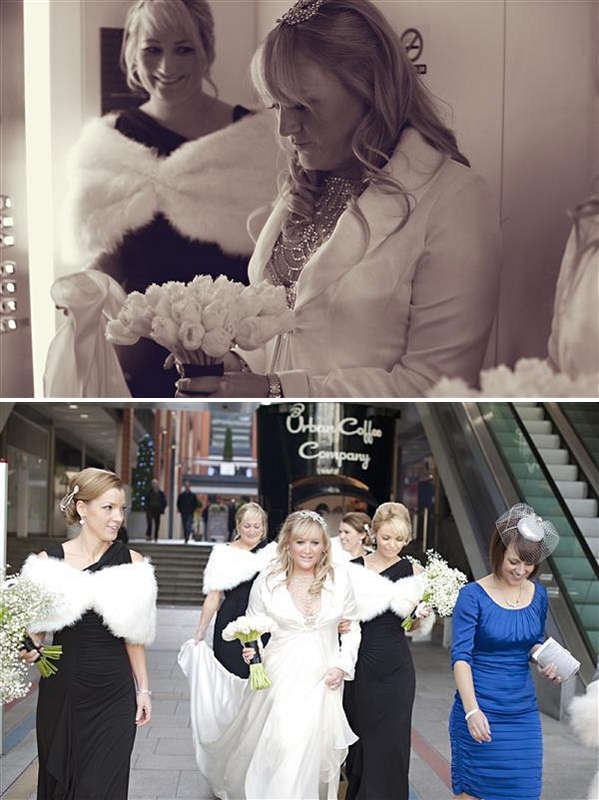 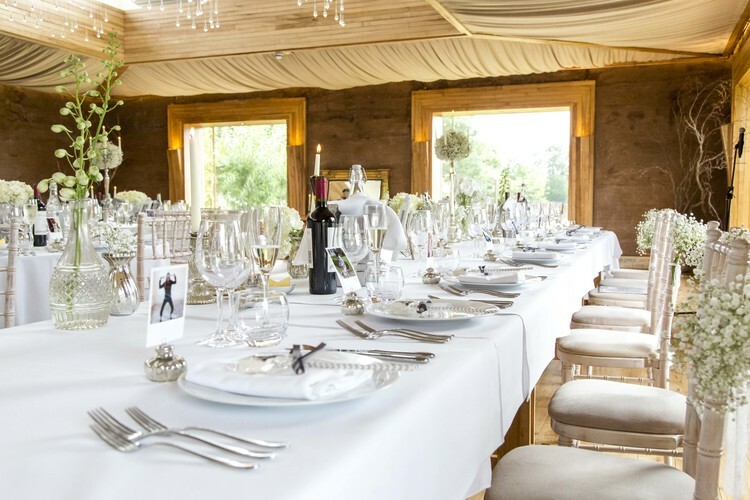 As winter is on it’s way we thought we’d share with you one of our all time favourite winter wonderland weddings. 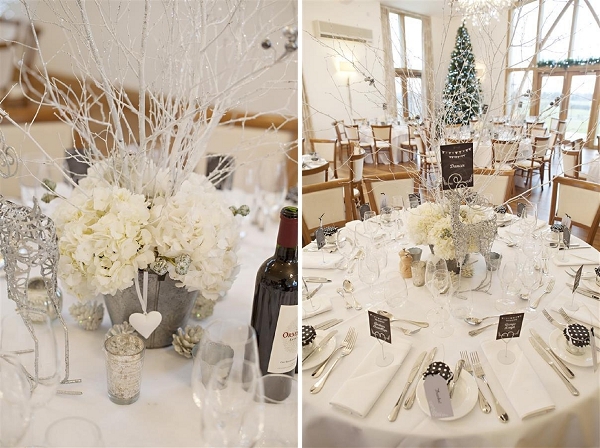 This winter wonderland wedding had a black, white and silver colour palette with a hint of sparkle. 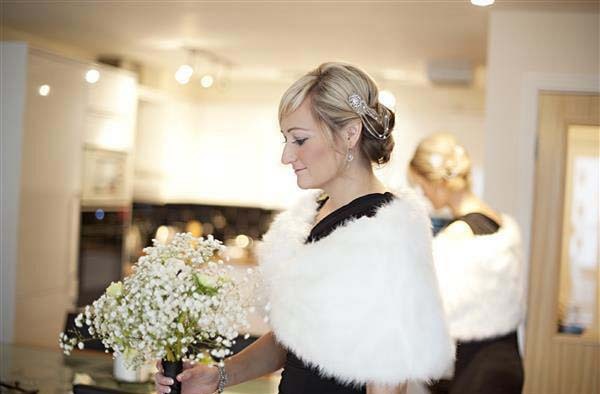 We did this wedding back in the winter of 2012 and still love this classic timeless look. 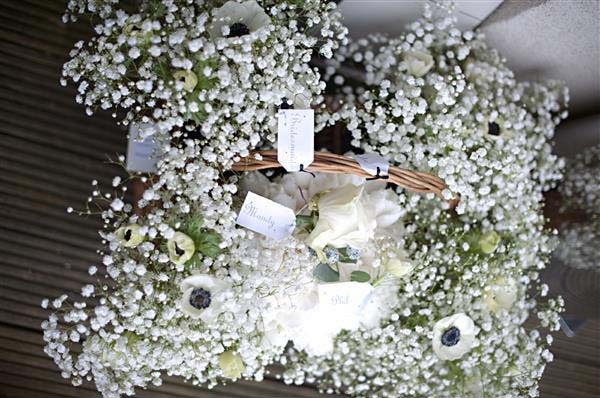 We used white flowers with highlights of black, including frilly honeymoon tulips, white gypsophila, black and white anemones and white hydrangeas. 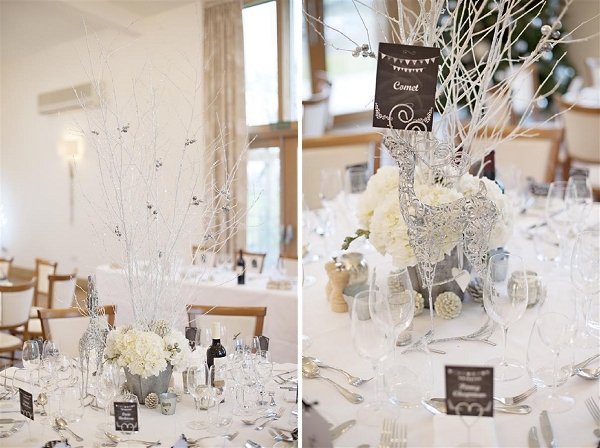 To bring in the silver and sparkle elements to the décor we used mercury silver vases, white and silver branches / twigs as well as fir cones to bring a natural winter look to the tables. 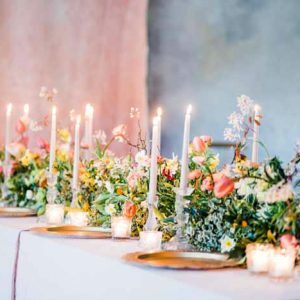 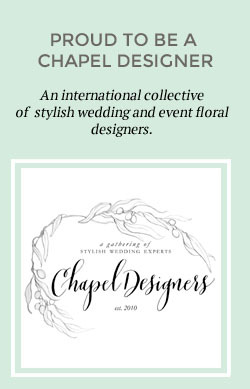 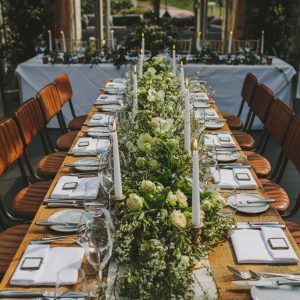 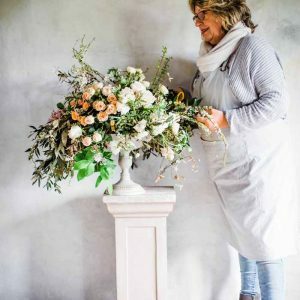 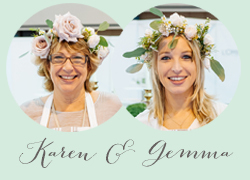 This wedding is from our blog archives, we have many more blog posts in our archives, for more floral inspiration browse some of our older weddings here. 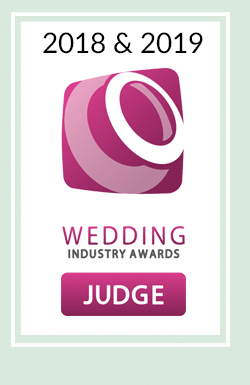 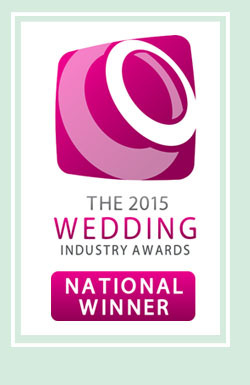 Our current blog dates back to May 2014 when our website was relaunched. 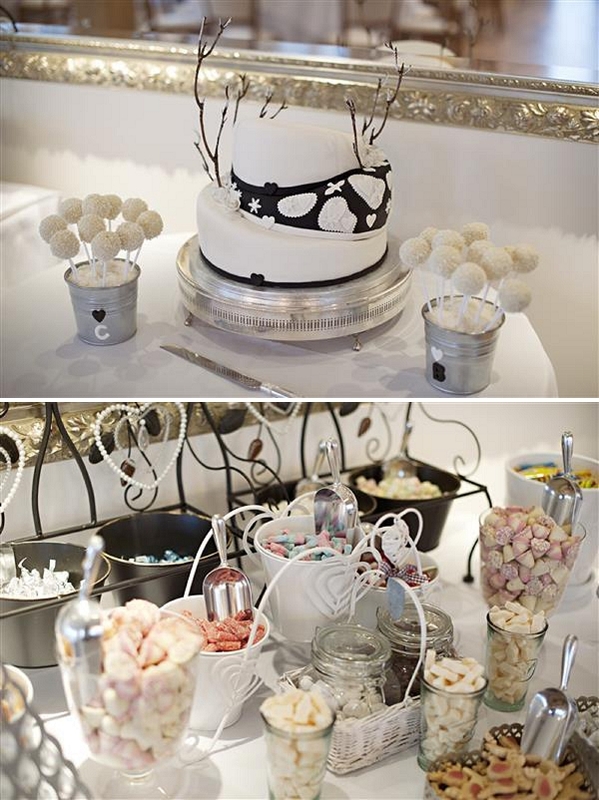 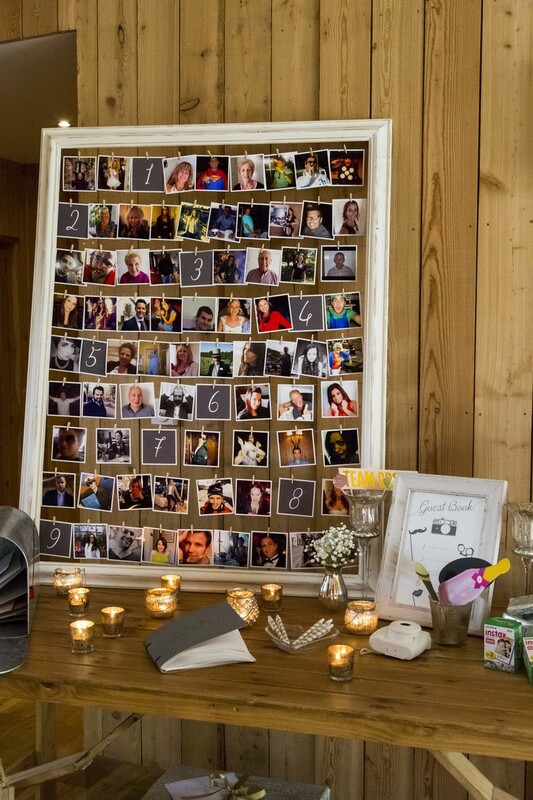 I just love weddings with lots of details and personal touches. 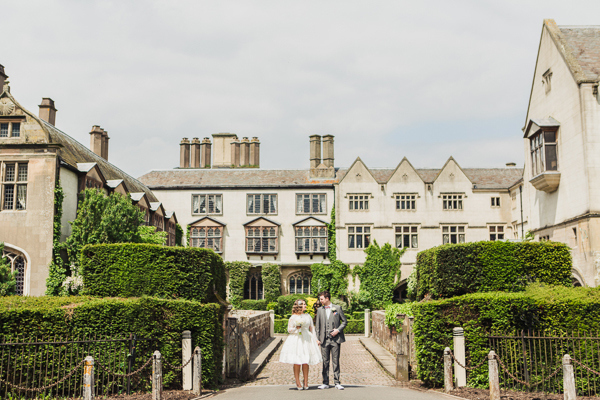 Steffi and Dan came down with their families to meet me and tell me about the Pride and Prejudice inspired wedding they were planning just perfect for the setting in The Cloisters at Coombe Abbey. 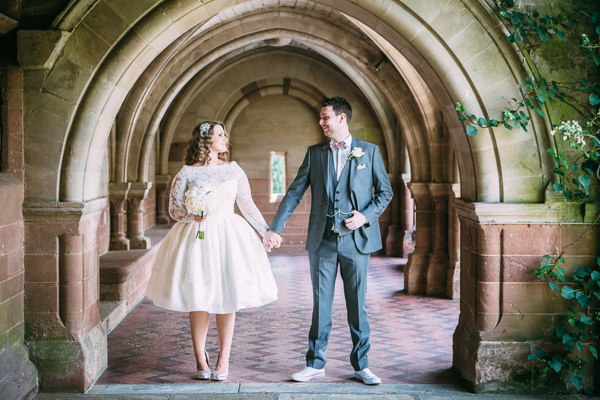 I loved the idea of incorporating The Second World War ideas and bringing in both their personalities to create a very personal and memorable wedding day truly reflecting them as a couple. 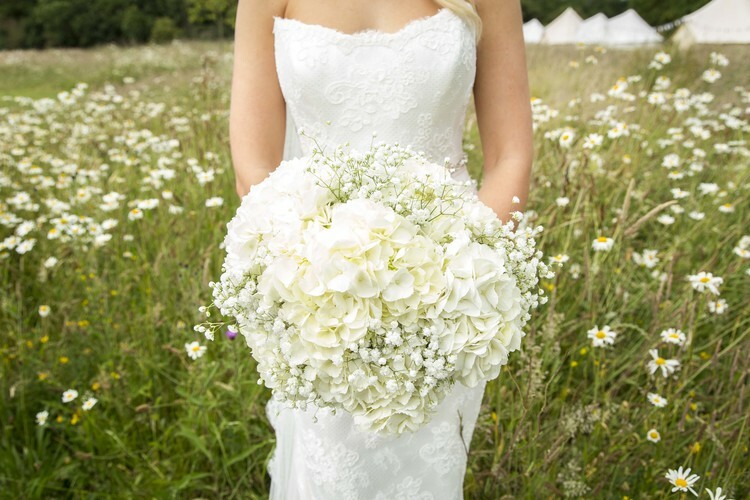 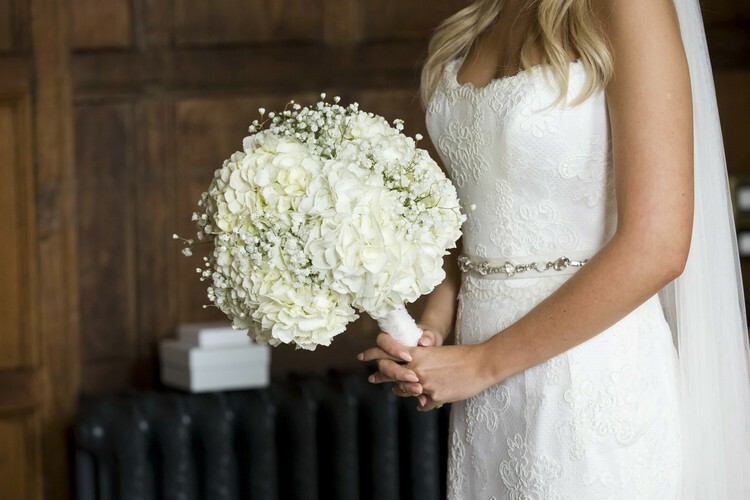 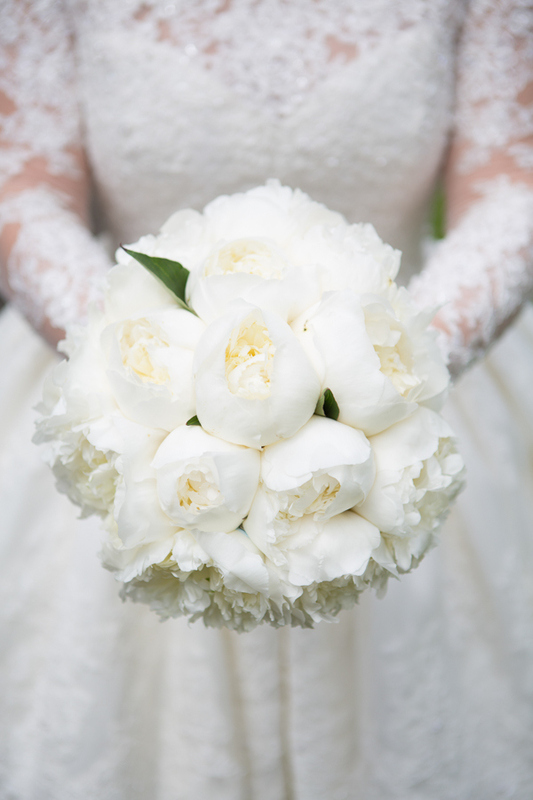 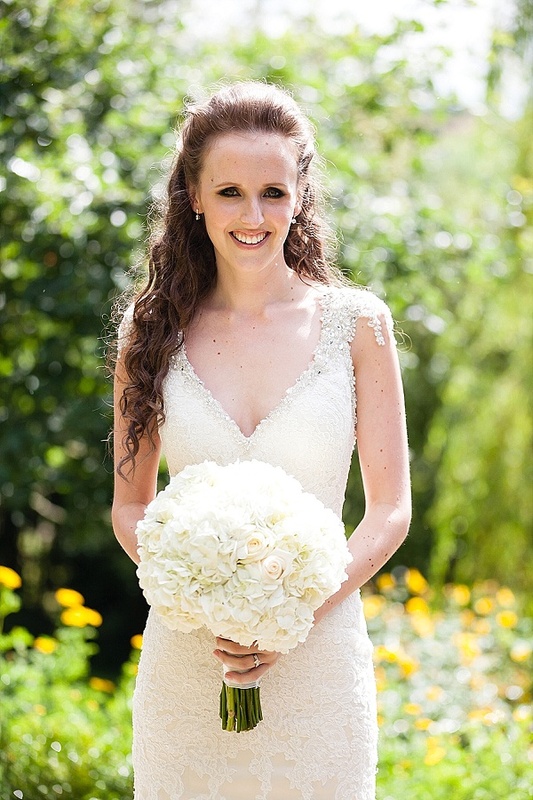 A white peony bouquet was created to give Steffi the romantic look she was after. 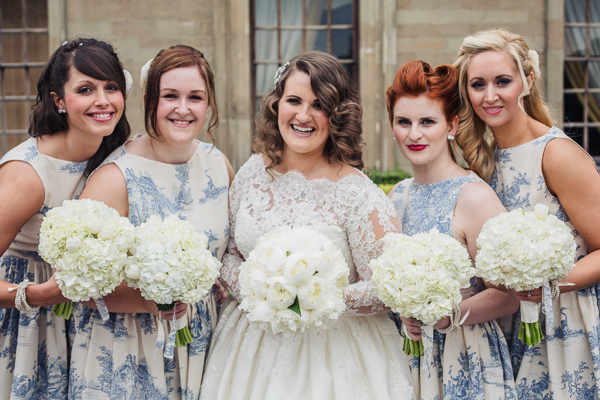 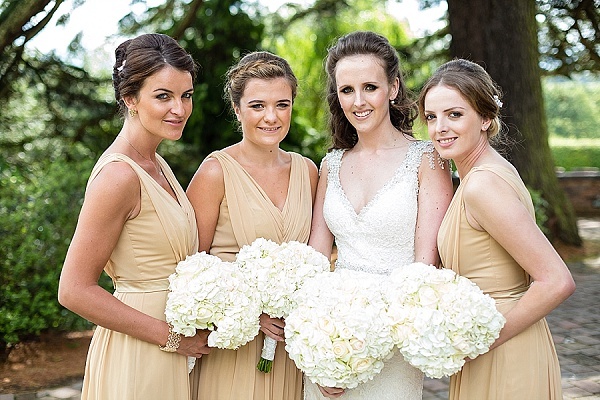 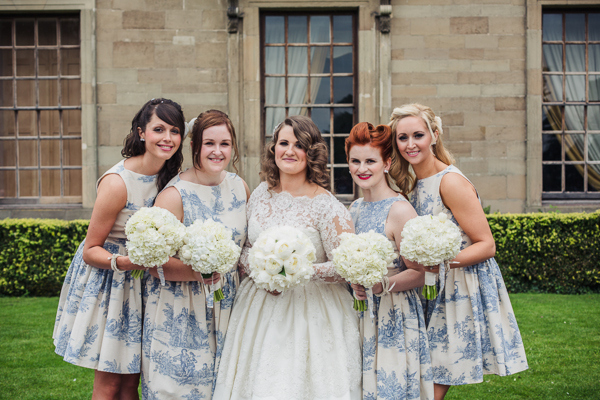 For the bridesmaids we chose fluffy hdrangea bouquets and added ribbon to match their beautiful vintage dresses. 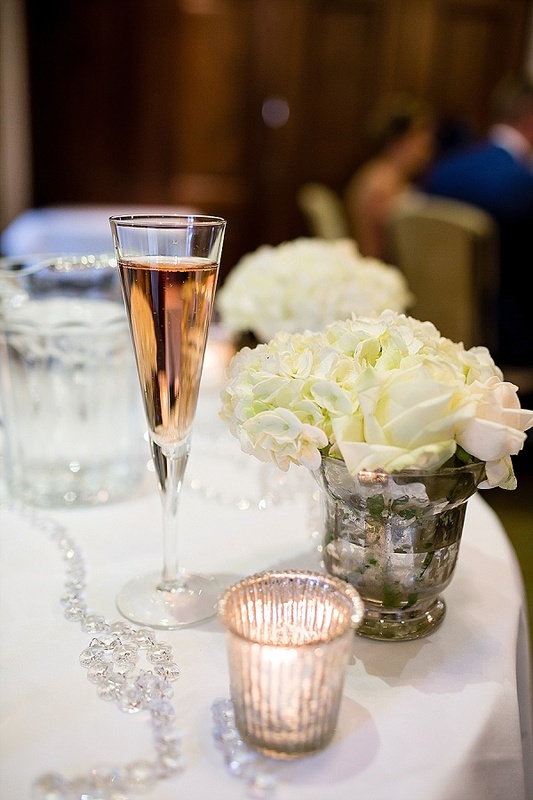 I just love the stylish look finished with pearl bracelets. 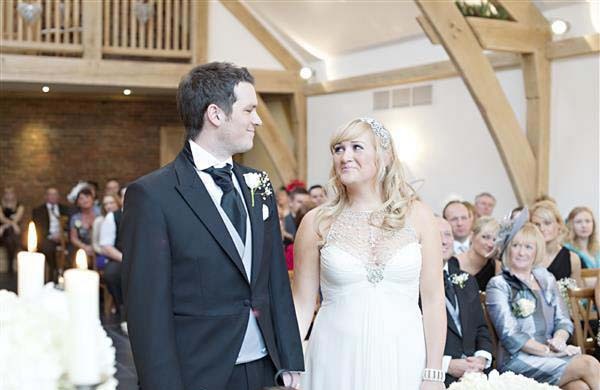 Dan looked dashing in his Union Jack bow tie teamed with a white rose button hole and pocket square. 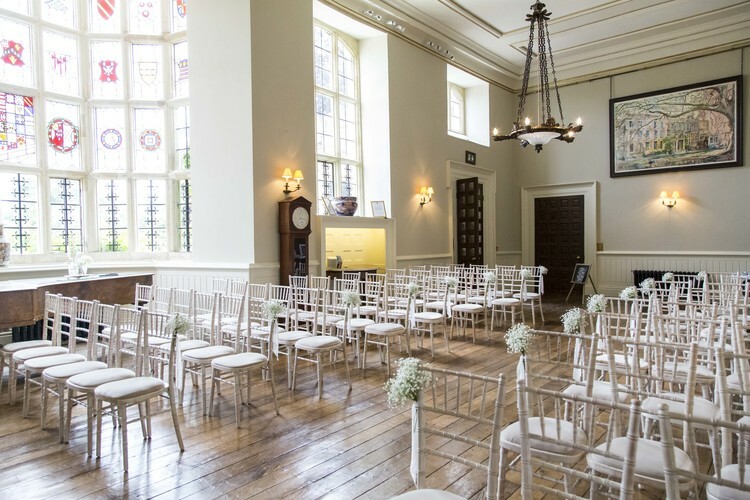 The room was enhanced with silver candelabra draped with pearls lining the aisle for a romantic setting for the wedding ceremony. 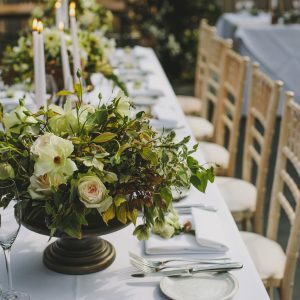 The magestic candelabra were set at the end of the top table and we added a floral ring of pure white flowers including hydrangeas, peonies, white garden roses, delphiniums and tulips perfect for a May wedding. 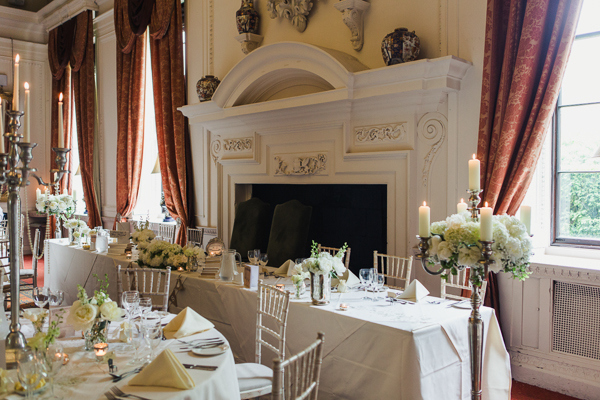 The fireplace provides a great backdrop and needs opulent flowers on the top table. 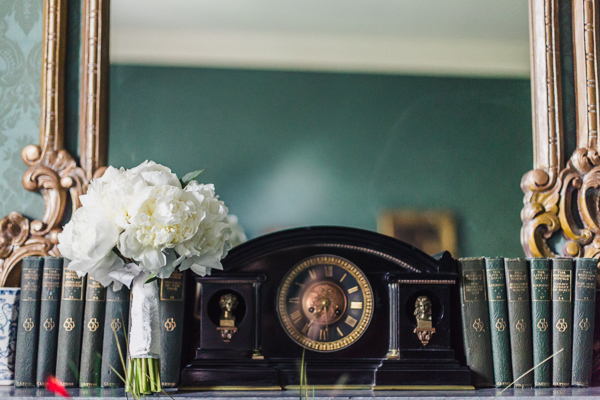 A large centre piece was created and we added vases of flowers, tea lights and stacks of books collected by the bride. 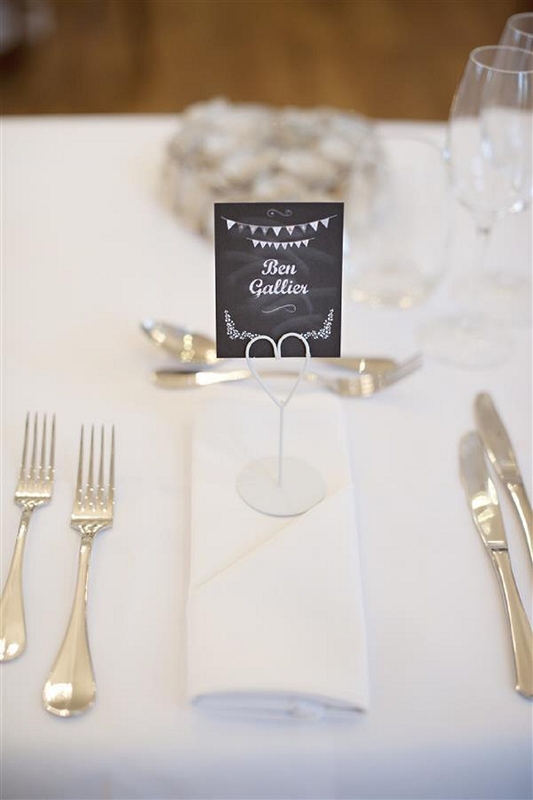 The guest tables had books for the guests, they had been asked their favourite book in the invitation and the bride had searched for the relevant books. 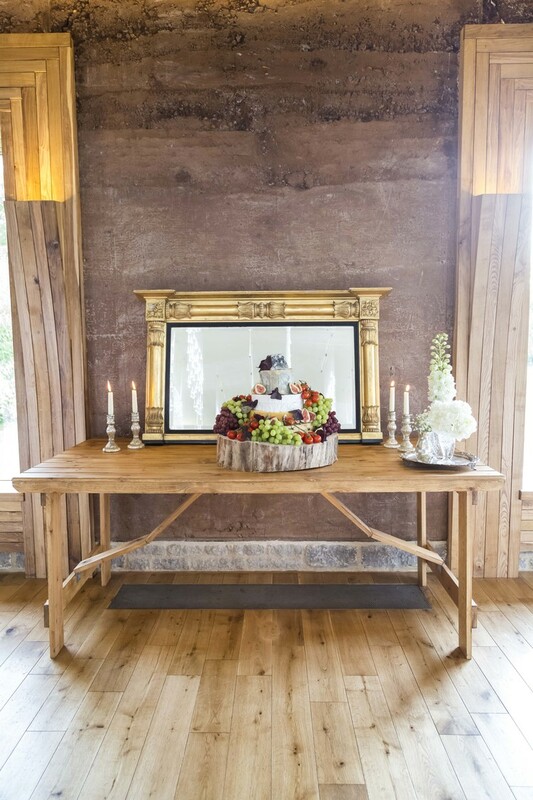 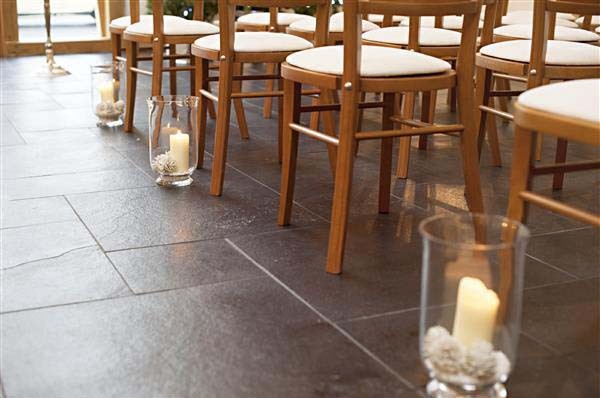 Vases of flowers filled the space on the tables and the elegant candlelight completed the look. 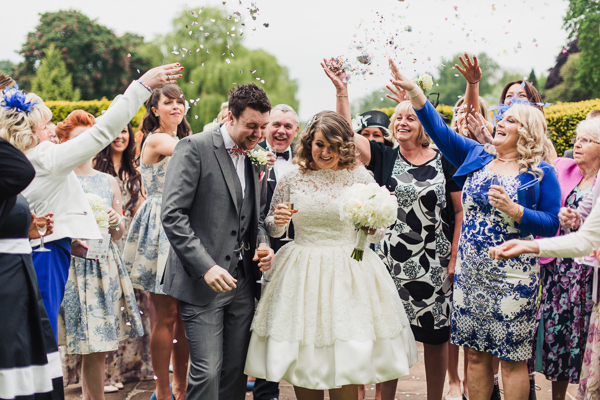 We were thrilled to see this wedding featured on Whimsical Wonderland Weddings Blog. 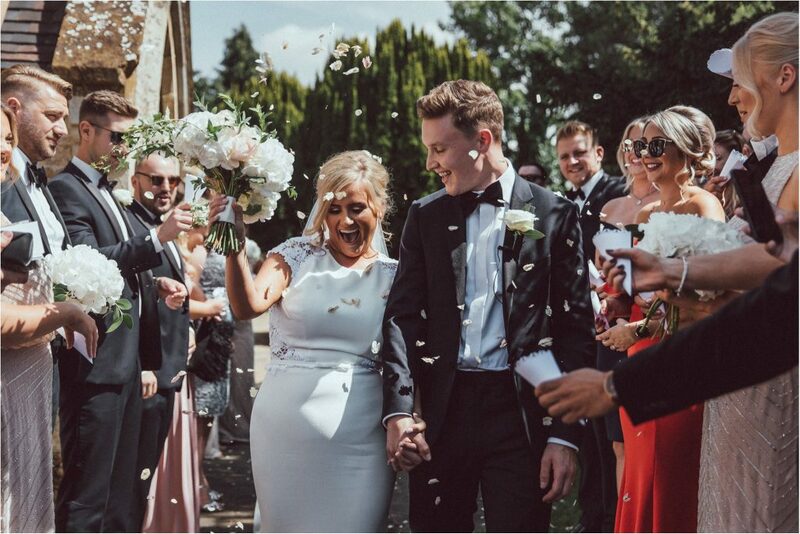 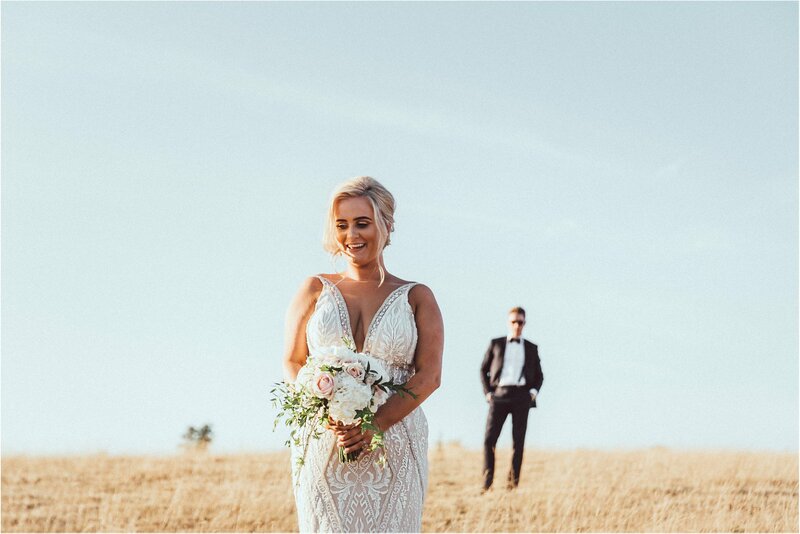 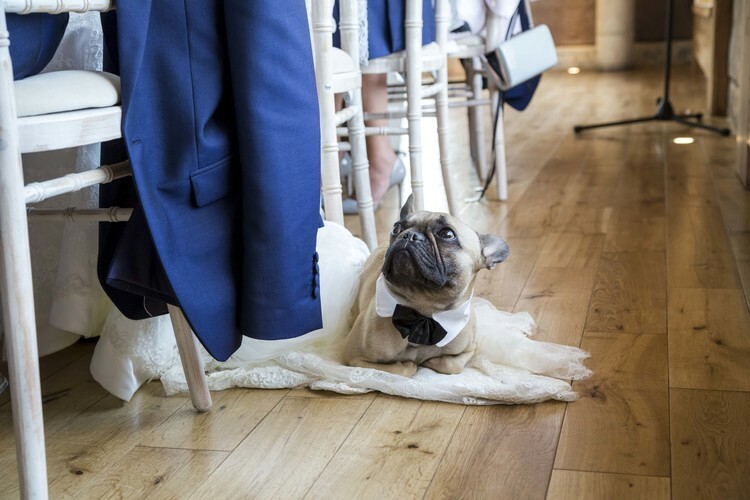 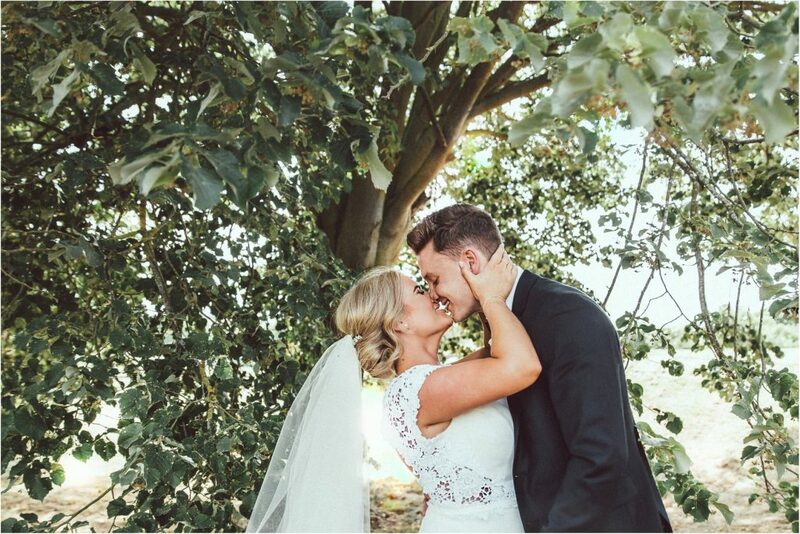 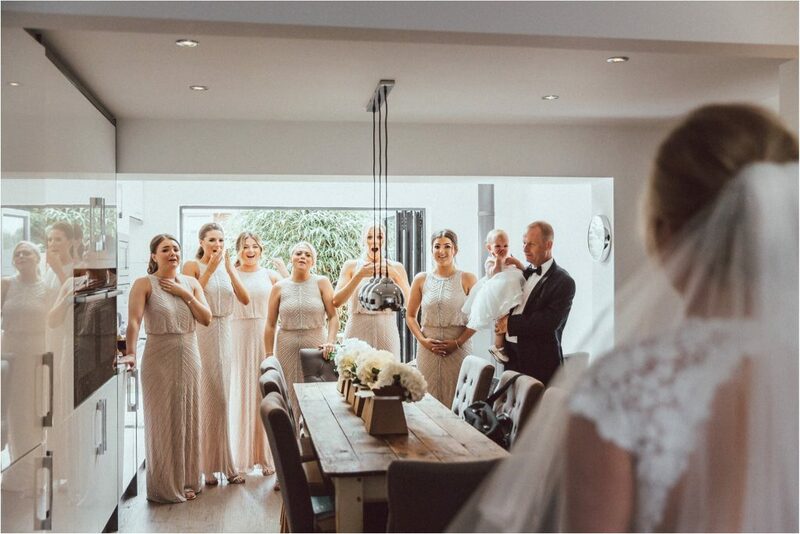 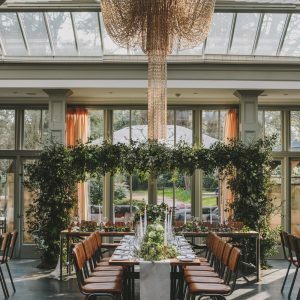 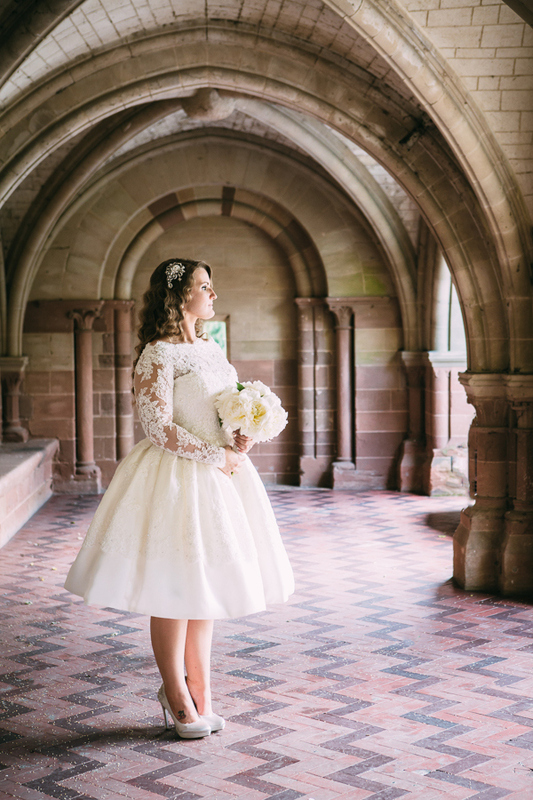 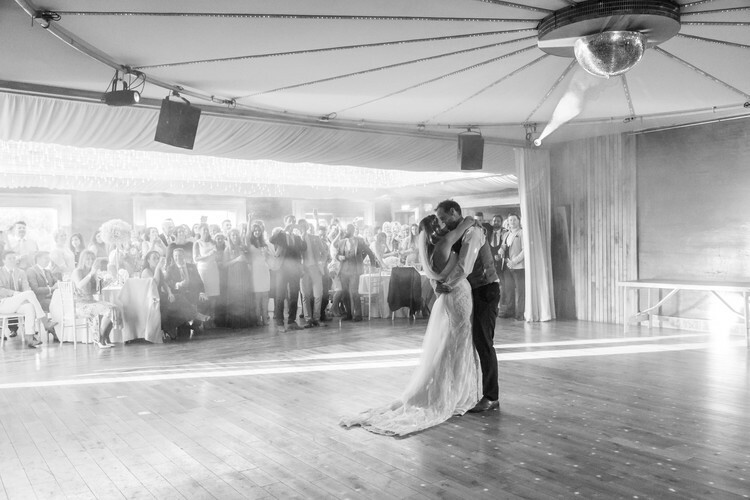 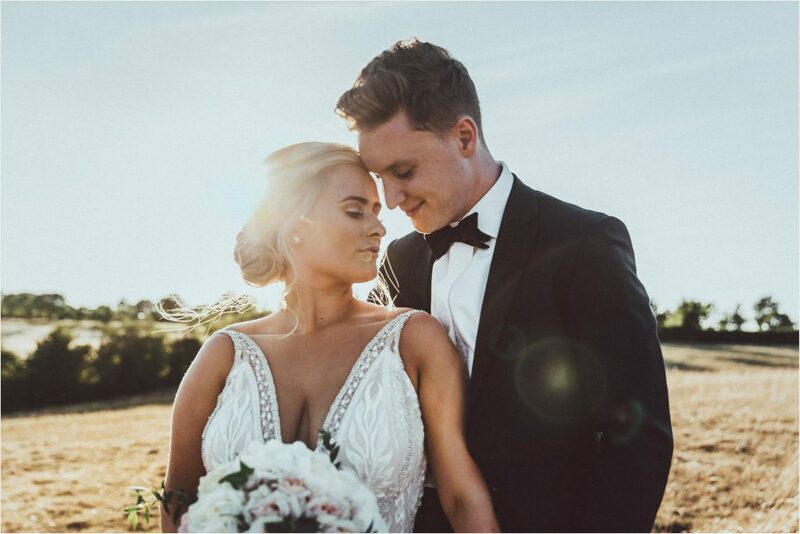 Rebecca and Ryan were planning a Hollywood glamour inspired wedding and enlisted our help to create their stylish look, beautifully captured by Jo Hastings. 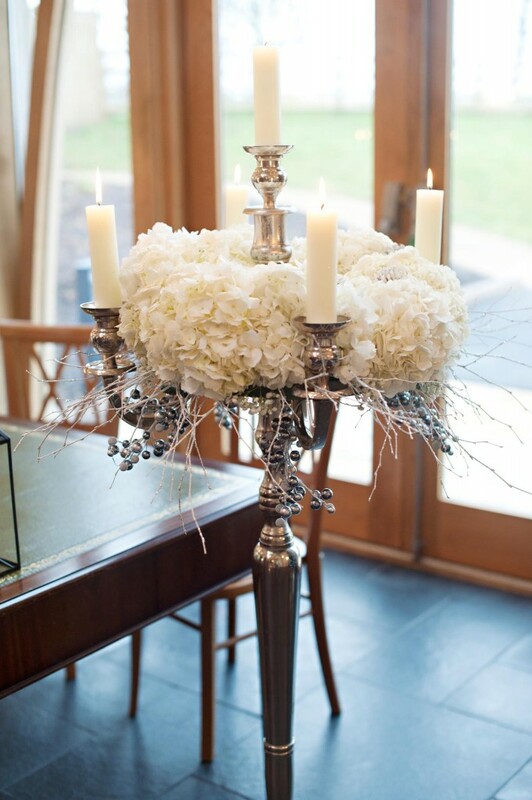 Rebecca had candlelight high on her list of priorities and loved crystals and white flowers with silver vases. 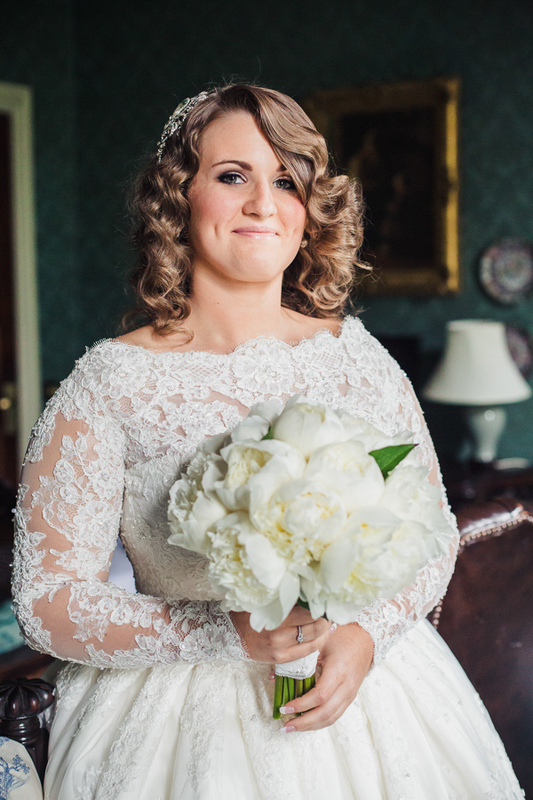 The bridal gown was so beautiful and suited a white bridal bouquet with hydrangeas and roses. 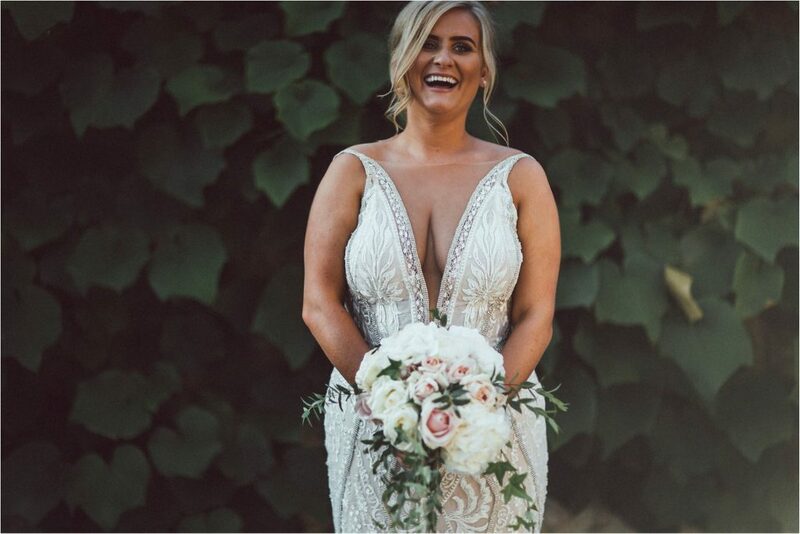 We wanted to ensure the bouquet we designed for her complemented her gown with its intricate embellisments rather than outshone it. 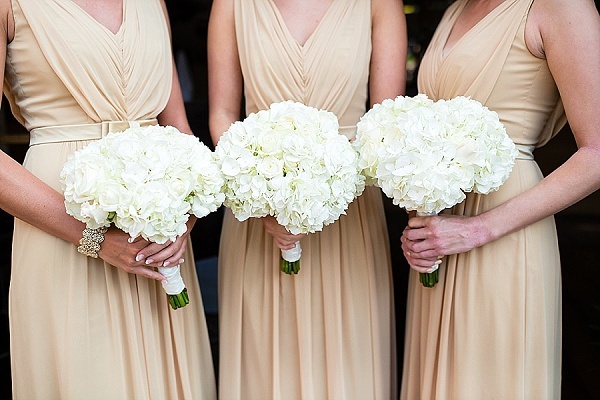 The girls wore Venetian style dresses in gold and so we created a smaller version of the bridal bouquet for them to carry with hydrangeas and roses. 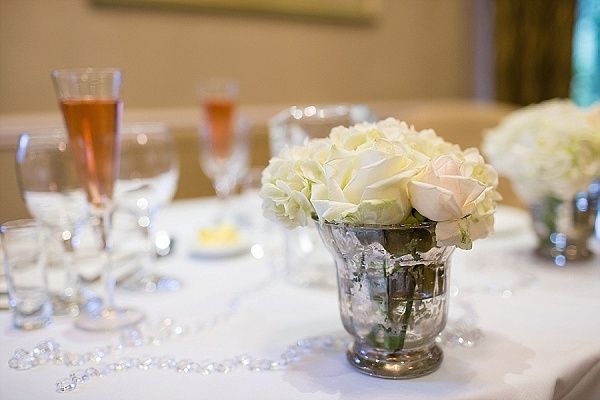 The stems were wrapped in organza ribbon with just a hint of shimmer. 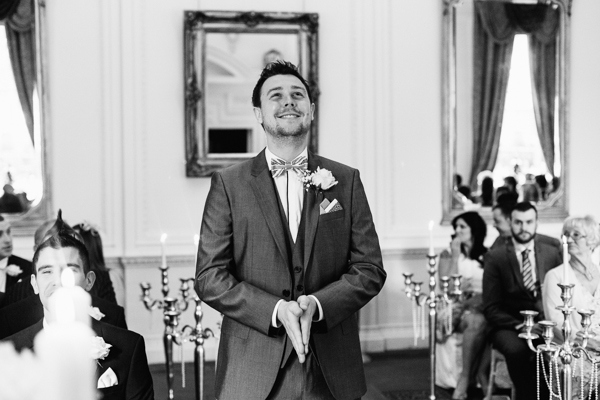 Ryan looked immaculate in this dicky bow, tailored suit and white hydrange button hole waiting for his bride. 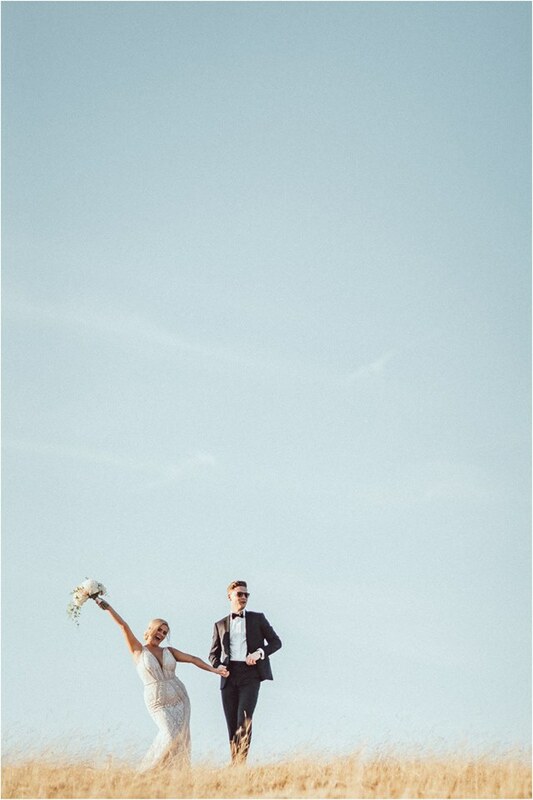 What a cool dude. 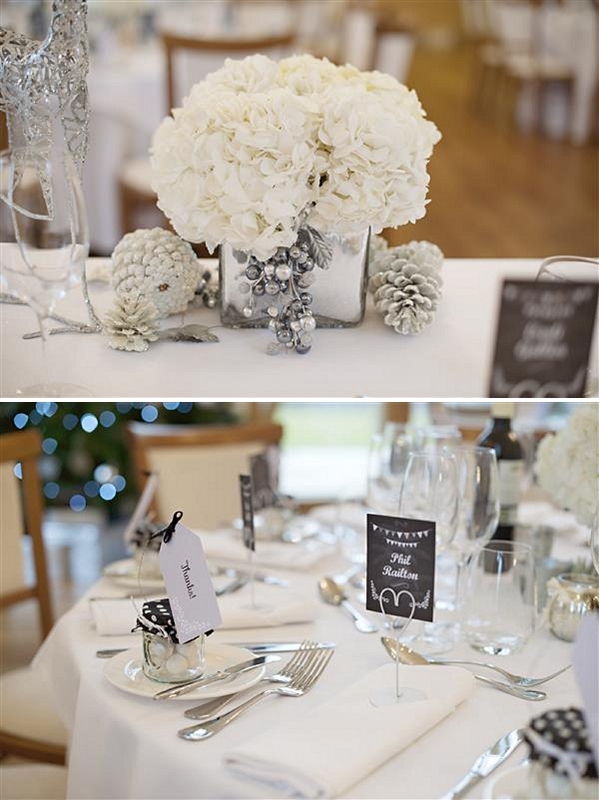 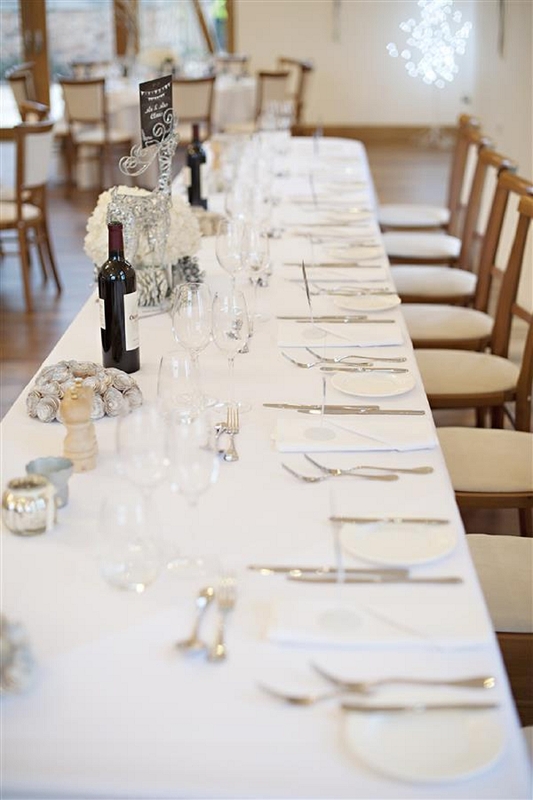 To continue the Hollywood glamour tone set for the day we worked with white and silver to create the wedding centrepieces, vases lined the top table with silver voties and cascading crystals. 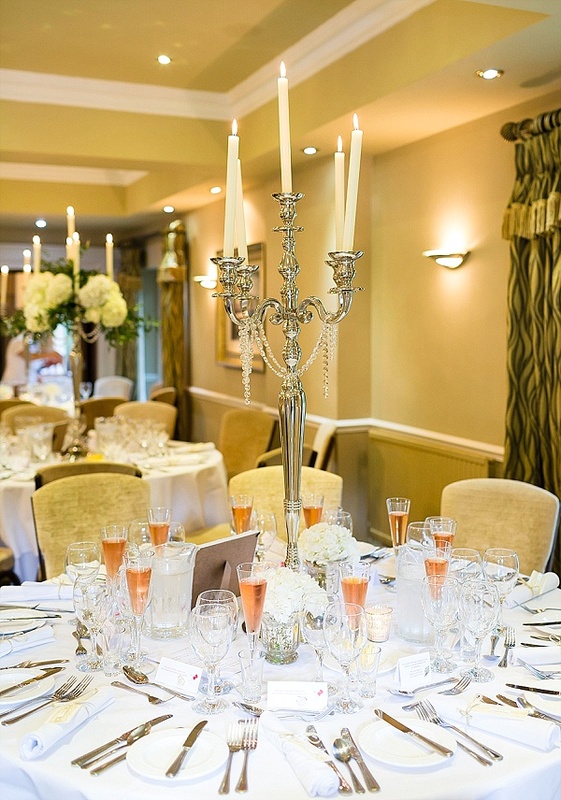 The guest tables had elegant candelabra draped with crystals and vases at table level or around the candelabra.